It's that time of the year again. The race of truth. Last year it was still the Mammoth March, but after it's glorious 10-year living, it passed away. Initially it was a shock, but very soon came the good news that it has reborn. 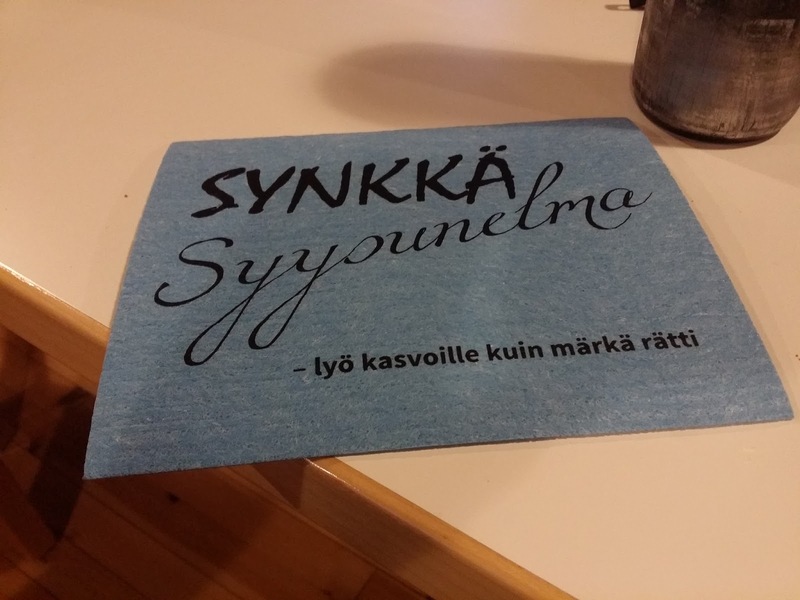 Now it's name is Synkkä Syysunelma, which roughly translates Gloomy Autumn Dream. The concept is still pretty much the same, but orienteering was to be just a bit more challenging this time. Also, the control points were featuring Barkley Marathons, as the racers had to tear a book page that is corresponding to racer's bib number. But let's wind the clocks back to year 2012. That's the year when I raced my first Mammoth March Impossible with a 5-men team in Vihti. It was incredibly hard race as I had lots of difficulties before and during the race. I suffered so much. I had done several 24-hour solo mountain biking races in the past which were hard too, but Mammoth March was even harder. It was different. It truly felt that this is a monster that tries to rip you apart. 2013 was a lot easier in Raasepori but there were still some hard moments, and for the first time, I saw briefly hallucinations. 2014 and Nuuksio. Massive sleep deprivation due to very bad circumstances knocked me out of the race early. A very bitter disappointment. 2015 and the 10-year anniversary race in Liesjärvi/Torronsuo. I teamed with Jarkko and I was orienteering for the first time. We were pretty close to finish it but we were running out of time and decided to abort the mission in a bog with dense vegetation. Another DNF. This summer was void of races for me. I was going to race Märynummi 12h in July but it was cancelled. When the place of Gloomy Autumn Dream was announced (Sammatti), I started to think about participation and made some questions to myself. Have I suffered enough in the past? Is there any point anymore to go through all of it? Well, I haven't done it solo, so there was at least one reason. Also, the last two DNFs were still in the back of my mind. I really wanted to succeed. But I was not going to come with my A game, hardly B game, as my form is not so good at the moment. And I am still pretty new to orienteering. I discussed these matters with my former team mates. When Jarkko figured out that it's better for him to do the shorter 100 km 'March' and Matti was going to run 50 km 'Marathon', it started to look like I was going to do 160 km 'Anguish' solo. When the control points were announced I finally made my decision. 160 km solo! Like always, all or nothing for me. To further justify my decision, this race is so hard and difficult that it guarantees me to confront my fear of failure, insecurities and weaknesses. At first I was very excited. This time I was going to make all the maps myself too. But fairly soon I was running out of time and I got help from Jarkko as he printed the maps for the first 24 control points which were same in March and Anguish. I still marked all 32 control points and planned my own route. I printed the remaining maps on Thursday evening, and marked the last points and lines only about 8 hours before the start of the race. I started to think that this doesn't look good. The race track looked really sketchy. It felt like I was 'craving' another DNF again. Not good. Ok people, I'm ready. Well, at least I hope so. It feels like I'm redefining how crazy I am to do this. The orienteering part feels a bit 'unnerving', to say the least. This will be really test for survival, period. With all these things in my mind it was clear that I should only race against myself and forget the actual race that was going in the background. After all, that has been my original race philosophy. The time limit was 30 hours, so I considered that finishing this monster should still be possible even with some major orienteering mistakes. The weather was looking pretty good on Friday. Overcast but dry, temps near +2°C, a bit of wind, and it was predicted to stay that way through the night and Saturday, only the wind would pick up on Saturday. The race centre was in the Camping site of Elämännokka, Sammatti. Small place just on the side of Enäjärvi lake. In some way, the worst moments are just before the race starts. The air felt surprisingly cold. I was very nervous. Most of the participants were in good moods and laughing inside the race office. I just wanted to be inside the car. Finally the race was about to start. Last year, there was Twin Peaks Theme as background music. This time, the race director performed small piece of music with fipple flute. Very different to last year, but still very fitting to this very unique race. All bikers started at the same time, 8PM. I didn't bring my camera, I wanted to concentrate completely in the race this time, so no photos. Like always, the start was pretty fast. I was briefly in the lead but when we headed towards the first control point I was slightly behind. The first two were easily found because there were plenty of other riders together. As planned, the 2nd control point required to leave your bike on the side of the road and hike up to a hill. I was together with Jarkko at this point. The trail to 3rd was clearly on the map but we didn't find it right away. The trail was rideable for the most part, and we were going up a hill again. 3rd was inside a mailbox which were easily found on a tree. The mailbox had probably some kind of purpose there because the trail was an official hiking trail. I was still with Jarkko. We knew that 4th and 5th would possibly be the worst control points because they required several hundred meters of bike pushing. Our course to 4th wasn't very direct, and we had to push through pretty rough vegetation. Not a big mistake, but it definitely cost some time. But on the way to 5th things got tricky. As on the map, there were two big rocks and we had to evade them. We decided to take a 'path' to the right. There were lots of trees down because of a forestry machine. After slogging through that we encoutered a dense birch grove. At this point we were already heading to a wrong direction, and evading the birch grove further pushed us to a wrong direction. We realized it when we found ourselves on the side of field. Very close to that field were a gravel road, but it headed to restrictred area (defined in the race rules). We decided to cross the field to circumvent the area, and we finally found the road to 5th point. But all this cost a lot of time. Big mistake but that's part of this race, especially for novice orienteerers. 6th point was the swimming point and not far away. There were lots of other racers. Not really a rush of them, but I didn't like the situation and I was already a bit too cool because riding from 5th to 6th was mainly downhill. Jarkko was fast and went for the swim while I hesitated and tried to warm up. Soon I got undressed and put a swimming vest on. The race director, Karhunsolan Tiukunen, was there as a lifeguard and got a headlamp to give a bit of light in the pitch darkness. Like always, the swimming distance was fortunately pretty short, at 10 meters. But the water was brutally cold, a lot colder than it was last year. I almost got some kind of cold shock and was relieved when I got up from water. But I did it! Jarkko was of course gone and now I was alone, which of course was a good situatution for my solo mission. 7th point looked tricky on the map, no trail, inside a forest, I found it fairly easily when I saw some racers coming back from the direction what I was looking for. The books were inside a black plastic bag which had two snippets of reflective tape on them. Onward to 8th. I found the correct trail and after that a small forest road. On the map, the course looked pretty straightforward and I should find the correct intersection easily. After some riding I noticed that something is not right. There was an intersection, but it didn't look like it should on the map. Damn! I was in a completely wrong place! It took a while to figure out where I was, and I started to think that this is it, the end. But, but, I calmed down and decided to just backtrack as long as I found the right intersection. On the map there should be a beam nearby so that should help me too. Finally I found one and it started to look like I'm back on the right track. And I was! On the way to 8th I met one two-man team and exchanged some words with them. They were also doing the 160 km Anguish. I told them that I was pretty lost for awhile but was now on the right track. At the 8th point I ate and drink, like in most of the other points. No problems with the 9th and 10th point, but I was surprised when I met the same two-man team, HK Gunthers, at the 10th. They had a shortcut on the way to 9th which was apparently slow and rough. I stayed and co-operated with them through the night from 10th to 20th point. Although we were riding in the middle of the night in complete darkness, it was already clear that the whole area was a very stunning network of small gravel and forest roads. We found some of the points easily, while others not so easily and we did some smaller orienteering mistakes. The highlights were definitely the two ponds: 14. 'Pienimulkkulammi' (Smalldickpond, yes, really. Finland is full of places with strange names) and 19. 'Kultalähde' (Goldspring). During the night we met runners many times. Apparently they had the orienteering part figured out pretty well. Close to 20th point I met Jarkko. We searched the points 21-24 together. Finally the darkness was behind us. Another positive thing was that I wasn't sleepy at all during the night, but I was low on energy around 19th, and the long night had taken a lot from me. 24th was a bit tricky, and one 160 km runner, Marko Vapa, was also there but hadn't found it. I had close-up maps for every point and I showed it to Marko. He instantly figured out where we should search it. Soon we found it. Jarkko had still 25th and 26th to go as they were different in 100 km and 160 km tracks. Jarkko was close to finish but I had still a long way to go, and he wished me good luck. With 25th I did a couple of small mistakes but eventually found it. 26th was easier. After that I had a longer transfer to 27th. Again, for some reason, I missed the right track at some intersection and I wasn't completely sure where I was, but I knew that I was heading to right direction and should encounter a big road. I did that. I thought that I was too much on the eastern side on the planned route so I rode fairly long on the big road. But after passing the Kisko intersections I realized that actually I was more on the western side. Another big mistake. I backtracked and then found easily the right location of 27th, but I didn't find the actual control point, although I searched pretty much every stump of the location. I decided to call the track master in case the control point had been vandalized. He said that it was there but I was searching on the wrong side of the road. 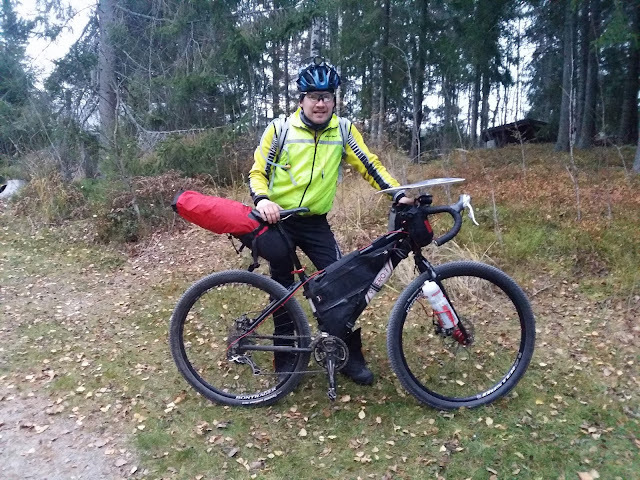 Shortly, another 160 km bike team arrived (Mäkiset) there too. My riding was pretty slow at this point but I wasn't giving up. I had still five control points to pick up. 28th was again a bit tricky but Mäkiset arrived there too, but riding a different route. It was the same thing with 29th, it was easier but Mäkiset were using different route. After 29th I changed my route plan because the original was a bit longer and used the same roads where I was a bit lost between 26th and 27th. But roughly 1/2 in the end was still the same. And oh man, the route was stunning! Small forest roads going up and down on the side of rapid and then some lakes. The wind was pretty hard and cold but now I knew that I really was on my way to finish this if I just don't get too much lost and somehow loose all of my energy. I did small mistake in the end on my way to 30th but nothing serious. After 30th I started to pick up my speed. It was incredible feeling! The wind was hard, I was alone, but I was feeling better. This was absolutely the best moment of the race. The thrill of adventure and being in control of things, alone. Now I knew that I was going to make it and there was nothing, nothing to stop me! I found 31st and 32nd points easily. The last one had a book named 'Freaks'. I laughed myself. Then I sprinted to the finish! In the finish Jarkko and the race director, Karhunsolan Tiukunen, congratulated me. I was absolutely overjoyed! I was so doubtful before the race, but I did it! My finishing time was 21 hours 29 minutes, well inside the 30 hour time limit and I had hoped to do it under 24 hours before the darkness arrives again. Mission accomplished! Every racer got that prize in the photo, a kitchen rag. It says: 'Gloomy Autumn Dream - hits your face like a wet rag'. Very well said indeed. I really love this race. In many ways, it's like life. It's hard, sometimes it's very hard and it hits you hard, but if you fight hard enough, in the end you can have the absolute feeling of accomplishment. And compared to other ultra endurance races, you really create your own race. You can visit many places which you might never otherwise visit. It's an adventure. And it's a pure journey inside yourself, to confront your fears, insecurities and weaknesses. And of course, put your strenght, or what of it is left in the end, in to use. This race has been, and I'm pretty sure it will be, very important for me. The race crew has done incredible work and they have created a very unique opportunity every year here in Finland. Huge thanks again, and I hope to come back and meet you again next year!